Elaine Petkovsek, Sandee Decker, Jerry Burkhart, Ralph Diguglielmo, Greg Thurston. To see taped excerpts from the show, CLICK HERE. 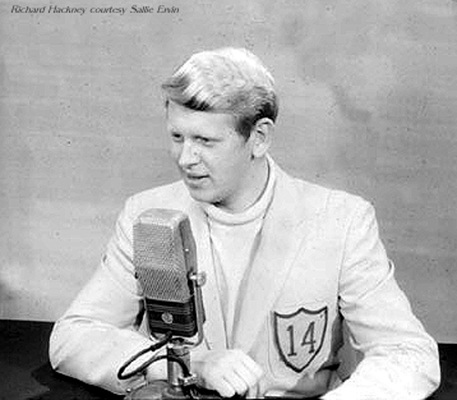 Lee Shubert, standing before a SOITA (Southwestern Ohio Instructional Television Association) map. Above: Jim Patterson, Janis Golon, Tom Collins, Lee and Pam Shubert Taken from stairs, facing main entrance from parking lot. A documentary about the show. 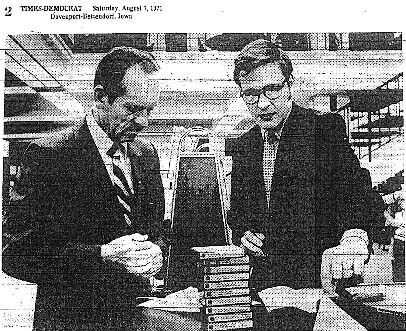 "Jim Grover, right, representing Miami University Radio, presents Robert Kellenberger, chairman of the Davenport Public Library Board of Trustees, original tapes of 15 half-hour radio shows, including interviews with many musical greats who knew and admired Bix Beiderbecke. Grover says the programs will soon be aired on national radio networks." CLICK HERE to see Jim Grover's thesis web site.